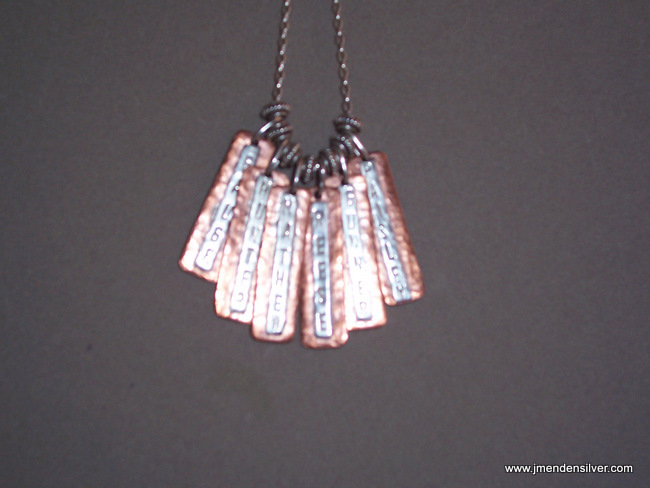 These name pendants are made using a hammered copper back plate with a sterling name tag sweat soldered over the top. I drilled a hole in the top and soldered on a generous sized jump ring for the bail. They can be worn in a clump or individually. It is also possible to engrave (my handwriting or yours) on the copper back plate. Inspirational words also make excellent pendants. Please indicate in a detailed email or a phone conversation what you would like to have written and what size pendant you would like.